Last-minute rescue efforts on East 13th Street. If one was looking for polo ponies in early 20th-century Manhattan, or perhaps a very fine carriage, the first stop was likely to be Van Tassell & Kearney’s Sales Ring. 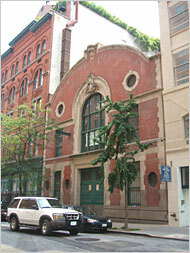 The business was housed in a red brick building on 13th Street near Third Avenue and outfitted with porthole windows, an oversize double-door entrance and an elegantly curved crown on its facade. The building, constructed in 1903, has had several lives. After the horse era, auto auctions were held there. And during World War II, women were trained in the building for work in the defense industry. From 1978 until last year, the space served as the studio for the painter and sculptor Frank Stella. Since then, a developer has announced plans for a seven-story residential building on the site. Yet the old stable, covered in scaffolding and blue netting, has not yet been torn down, and the city’s Landmarks Preservation Commission is scheduled to hold an emergency hearing on Thursday to decide whether to grant it historical protection. “We knew the building was for sale, but we thought it was simply going to be readapted to a new use,” said Andrew Berman, executive director of the Greenwich Village Society for Historic Preservation, which asked the commission to consider the building. Then his group learned the building was in danger of being torn down. In its research, Mr. Berman’s organization discovered not only details about Van Tassell & Kearney’s but also about its clients, who included the Vanderbilts and other members of turn-of-the-century high society. Isaac Mishan, who is listed as the owner of the building on city documents, did not respond to three phone messages left at his office last week. The firm Kutnicki Bernstein Architects has posted on its Web site a drawing of the proposed building, which would feature a largely glass front and several balconies for residents. Yet if the Landmarks Commission grants historic status to the existing building after Thursday’s meeting, Van Tassell & Kearney’s auction house will never see a wrecking ball. People are really f...ing nuts. That stable is beautiful. Once again, with all of the crap in Manhattan, it amazes me that developers want to raze beautiful buildings. That's actually an improvement over the previous design but couldn't they just convert the stable and make a decent profit that way. This is one to save! Truly a landmark, it's such an unusual and character-laden building. It's insane to tear this one down. 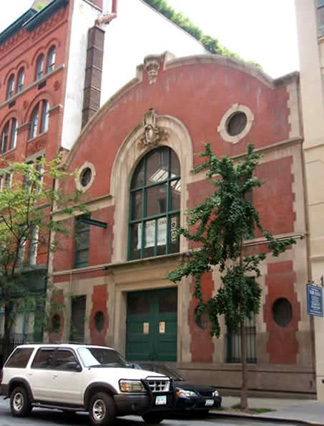 Thursday, September 7th at 1:30: Landmarks Preservation Commission Emergency Hearing re: 128 East 13th Street. The LPC will hold a public hearing regarding this immediately endangered building in their hearing room at One Centre Street (at Chambers Street), 9th floor. PLEASE COME TESTIFY IN SUPPORT OF IMMEDIATE LANDMARK DESIGNATION. Bring 12 copies of your testimony so you can submit written testimony even if you can’t stay to speak. For more information and sample speaking points, go to www.gvshp.org/stable.htm; also see coverage in this Sunday’s New York Times at www.nytimes.com/2006/09/03/nyregion/thecity/03hors.html?_r=1&oref=slogin. The New York City Landmarks Preservation Commission held a special public hearing today on the proposed designation of the former Van Tassell & Kearney’s Horse Auction Mart building at 126-8 East 13th Street, a property that had been acquired last year by a developer who filed plans this past July to replace it with a 7-seven-story residential condominium building with a mostly glass façade with balconies designed by Kutnicki Bernstein Architects. No demolition permit has yet been applied for and the commission’s meeting was requested by several preservation groups including the Greenwich Village Society for Historic Preservation. Robert Tierney, the commission’s chairman, announced at the start of the hearing that no action on the proposed designation would be taken today, but added that the commission had reached a “stand-still” agreement with the owner, who was identified in city documents as Isaac Mishan of Ultimate Realty and who was represented at the hearing by Jay Segal, an attorney, who said the owner would “work hard” to see if an alternate revenue scheme for the property could be found, noting that the system was “flawed” when owners make purchases “in good faith” based on market values and the city’s preservation intentions for the properties are not established. Other testimony in support of the proposed designation was given by City Councilperson Rosie Mendez and representatives of the Municipal Art Society, the New York Landmarks Conservancy, the Historic Districts Council and State Senator Thomas K. Duane, State Assemblyman Deborah J. Glick. 420 East 61st Street - Any info?